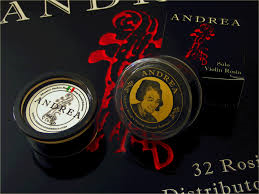 Now offering Andrea Solo Rosin in mini cakes. Andrea rosin is used by professionals worldwide for violin, viola, and cello. This dark rosin is slightly softer and grips a bit better. Works well with our synthetic hair Incredibows, as well as traditional horsehair bows. $18.00 with any bow order. First class shipping when ordered alone, included in price.